Here we go again, bringing the producers of our community the best of the best production resources for you to study and abuse to beef up your production quality and skill. 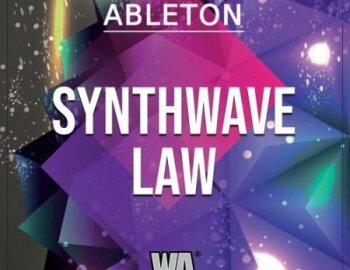 Synthwave Law brings you a chance to see how the professionals create a booming Synthwave track. This particular Template was crafted in the key of Am, and in the tempo of 80 BPM as that is usually the tempo that Synthwave Tracks are written in. This template comes with amazing recourses and elements such as an Ableton Template that gives you a detailed look at the arrangement and and over all design of the track, all of the Stems of each element in the project, every Preset used in the Template stems and all of the MIDI files of each stems, which allows you to recreate the template with your own sounds. The Ableton Template is amazing and a great way to learn the basics of mastering and mix down, as having this template lets you see the mixer so you can study the final master of the Template. You can also view what effects we put on elements such as Drums, Synths and FX. You can also substitute the presets we used and samples to change the sound and adjust some mix down and mastering elements to fit said samples. Whatever you need to do to learn the fundamentals is here in this Template! Check out what all comes in this amazing pack!